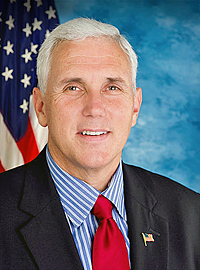 Mike Pence has worked as a Lawyer, a political talk show radio host, a Congressman, and now serves the Hoosier State as Governor, elected in 2013. Pence’s family raised him as a staunch Catholic. He attended Mass several times a week as a child and served as an altar boy on multiple occasions. He committed his life to Christ in college. Governor Pence would be the first to say he’s not perfect. In fact, he calls himself a “pretty ordinary Christian.” But, his record in politics speaks volumes, Obviously he strives to make political dealings based upon his knowledge of Scripture and his walk with Jesus Christ. While in Congress, he was characterized as one of the strongest social Conservatives in the Republican Party. Maybe…just maybe…a little Pence might wear off on Trump. And that wouldn’t be a bad thing. Christian, Husband, Father of 6, Student Pastor. This blog has no ties to the Church I serve.